This belt is 38mm (1½″) wide and made from high quality Italian leather. 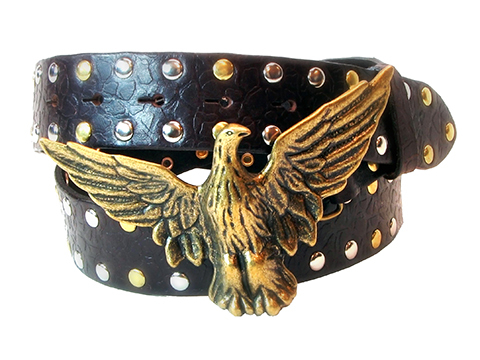 The buckle features an eagle with upward pointing spread wings. The buckle has three choices of finish and is made from tough zinc alloy. The leather has been textured and has silver and gold rivets around the border reflecting the finish of the buckle. A belt loop is optional for this belt.